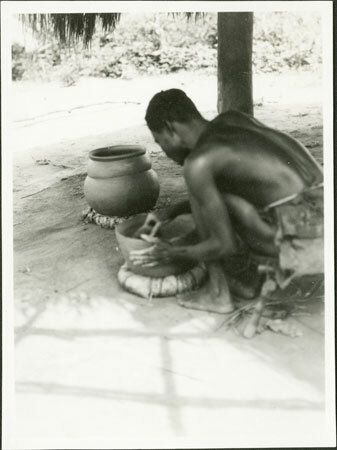 A man making an earthenware pot (pere), skimming his hand around the inside rim of the vessel with a tool whilst the clay is soft. The pot rests on a ring of bound grasses for stability. A finished one with a bulbous upper section and rim can be seen beyond. Notes on card mount m/s pencil - "ss.rcs 6/87"
Morton, Chris. "Zande potter " Southern Sudan Project (in development). 03 Jan. 2006. Pitt Rivers Museum. <http://southernsudan.prm.ox.ac.uk/details/1998.341.356.2/>.